Chapter 2, 3, 4 and 7 from Swedish Economic Forum Report 2018. In Navigating under uncertainty – entrepreneurship, innovations and experimental policy, continuous adaptability is lifted as a critical factor in maintaining high prosperity. Swedish Entrepreneurship Forum presents this research publication for the tenth consecutive year in conjunction with the Swedish Economic Forum conference. 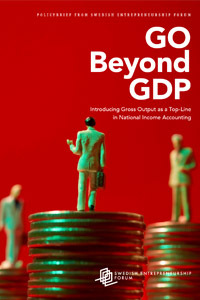 Since 2014, the US uses GO – Gross Output – as a complementary measure of GDP. GO, gross production, is a more complete measure of the overall economic activity of a nation. According to Mark Skousen, one of the world’s most influential economists who introduced GO in the US, focus is shifted from households and private consumption to corporate investment, innovation and entrepreneurship, which actually drives a country’s overall economic outcome. Evidence is gathering that philanthropy serves society in a number of ways. It provides private resources to build public goods such as schooling, health care, and academic research, and it introduces new and innovative ways of addressing old problems. Still, knowledge about philanthropy is quite limited in the Nordic economies, a feature shared with many other countries. 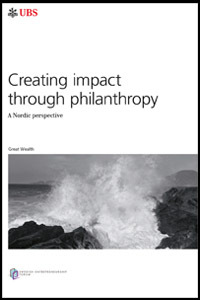 about the practice and impact of philanthropic giving in the Nordic countries, emphasizing the drivers to engage in philanthropy and lessons learnt from previous experiences. An increasing number of manufacturing companies such as Ericsson, Volvo and SAAB are today increasing investments in innovation by combining existing products with advanced industrial service innovations.. Vinit Parida, researcher at Luleå University of Technology and recipient of the 2016 Young Research Prize, has in several studies analyzed companies’ abilities to use digitization and networking to address the challenges and opportunities companies face. 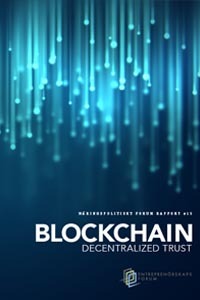 The report presents the blockchain, the technology behind as well as its development and impact. Blockchain technology enables sharing of information, assets and values between different parties globally, without intermediaries. Possible consequences of a widespread future use of the technology are investigated and a number of exciting future scenarios are presented. Based on the 2015 Global Entrepreneurship Monitor data, the report investigates similarities and differences between the dominant economic regions in terms of entrepreneurship, entrepreneurs’ ambition to grow, internationalize, as well as entrepreneurship attitudes. The report identifies the internationalization patterns of Swedish SMEs. 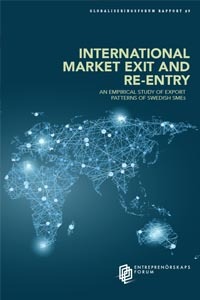 Specifically, the authors look at how, and why companies make exit from international markets and whether they return or seek new markets. In addition, the authors present a number of recommendations for how Swedish SMEs can be supported in their internationalization efforts. 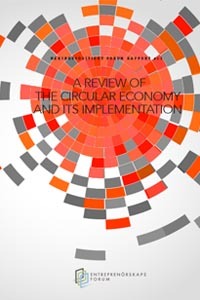 Circular economy (CE) which was introduced in 1990 is a sustainable development strategy proposed to tackle urgent problems of environmental degradation and resource scarcity. The 3R principles of CE are to reduce, reuse and recycle materials. Unlike the current linear system these principles account for a circular system where all materials are recycled, all energy is derived from renewables, activities support and rebuild the eco-system and resources are used to generate value and support human health and a healthy society. The report examines similarities and differences between the dominant economic regions in terms of entrepreneurship, entrepreneurs’ ambition to grow, internationalize, as well as attitudes towards entrepreneurship. 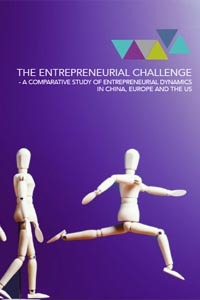 The report is based on the previous year’s data from Global Entrepreneurship Monitor. The Sharing Economy has been the subject of considerable interest among policy makers across the globe. This report begins by developing a pragmatic definition of the Sharing Economy. Next, the report describes global Sharing Economy trends, followed by an examination of the Sharing Economy in Sweden. Subsequent sections address regulatory considerations and potential economic implications. The report concludes with a discussion of possible policy responses. This policy brief outlines how migration can promote the internationalization of companies. With the help of detailed register data of Swedish companies, it gives new insights about the role that foreigners can play for internationalization in the form of services. 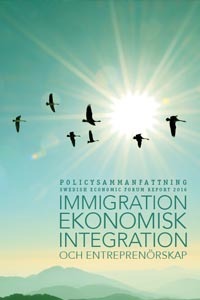 Thus, it contributes to a greater understanding of the driving force of internationalization in general and, more specifically, what migration can bring to Sweden’s economy. The report describes how the capital supply looks like for innovative startup companies in Sweden. Lack of funding is often identified as an obstacle to the emergence and development of these companies, which is a problem as innovative startup companies are play an important role in the creation of new jobs and growth. 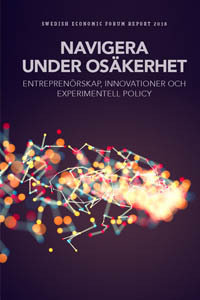 This book celebrates Swedish Entrepreneurship Forum’s twentieth anniversary and 20 years of research on entrepreneurship, SMEs and innovation. As the past 20 years have shown, the research problems are both complex and diverse and span several disciplines. The report analyzes global innovation dynamics and the effects of R & D increase in India and China. The report analyze the economic effects of 3D printing and future uses. The report collects opinions from experts who specialize in 3D printing and highlights examples of public initiatives to strengthen competition, encourage innovation and ensure skill growth in the 3D sector. This report studies private investment in green investments, links theory and policy and proposes future research areas. In this policy brief, based on the Swedish Economic Forum Report 2013, the report writers present the recipe to promote tomorrow’s successful job-creating entrepreneurs. A crucial factor is a functioning interaction between new growth companies and established companies. The latter are nursery schools for new fast growing companies. The prerequisites for new growth companies are therefore linked to Sweden’s ability to retain and remain attractive as the location of the major knowledge and technology-intensive multinational companies. What does the so-called “Cloud” mean for Swedish economy and the Swedish business community? Today many argue that we are faced with an even bigger paradigm shift – cloud services and socioeconomic spreading effects linked to the Cloud. The cloud service economy builds on the Internet, with the big difference that the user can now get so much more out of being connected to the Internet. How well prepared are we to take on the new technology and what does it mean for the long-term global competitiveness of Swedish business? The report Sweden’s Position in the Global Economy provides a broad overview of the various factors that underlie Sweden’s competitiveness. How well positioned is Sweden to handle future challenges, global structural changes and increasing global competition? What areas should decision-makers prioritize in order to lay the foundation for continued prosperity in the future? 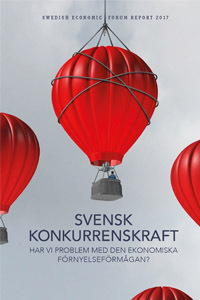 The report gives a number of proposals for various policy changes that would strengthen Sweden’s competitiveness. Rapporten The current state of the venture capital industry beskriver den svenska riskkapitalsektorns utveckling och struktur. Den ger ett internationellt perspektiv på den svenska riskkapitalsektorn och analyserar tillgången på riskkapital och alternativa finansieringsformer för nystartade företag. Vidare diskuteras hur krisåren påverkat utbudet av riskkapital. Rapporten mynnar ut i en rad policyförslag på hur politiken kan utformas för att stödja entreprenörskap och underlätta finansieringen av nya företag. Exports have a positive impact on economic growth. Exporting companies often have higher productivity compared to non-exporting companies. 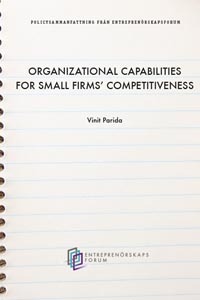 The report highlights the issue of internationalization competence in SMEs through a comprehensive literature study of existing empirical findings focusing on internationalization barriers and relevant competency types.